Dr. Rachna Joseph has obtained her MBBS from Christian Medical College & Hospital, Ludhiana, India. She later earned her MD Radio diagnosis at the same institution. Dr. Rachna has over 11 years of post MD experience. She began her career as a Senior Resident in the Department of Radio diagnosis and Medical Imaging at the St. Stephen’s Hospital, Delhi, India. She worked as a Senior Resident for more than 3 years, and then she became the Junior Consultant in the same organisation. After that she joined NMC Specialty Hospital in Abu Dhabi as a Specialist in the Department of Radiology. 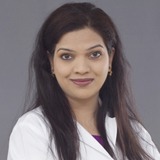 Dr. Rachna then moved to NMC Specialty Hospital, Al Ain in the same post. At NMC Specialty Hospital, Al Ain, Dr. Rachna is dealing with all modalities of diagnostic imagining with a focus on women’s health. Dr. Rachna is fluent in Hindi, English and Arabic.